The inspiration and vision for Lunch With Maria started at the grass roots level and is an idea driven purely from the heart. How could I assemble a group of women together and show them how truly remarkable they were? I wanted to create a network of powerful, like-minded women who could empower and inspire each other to transform their lives and live the life of their dreams. 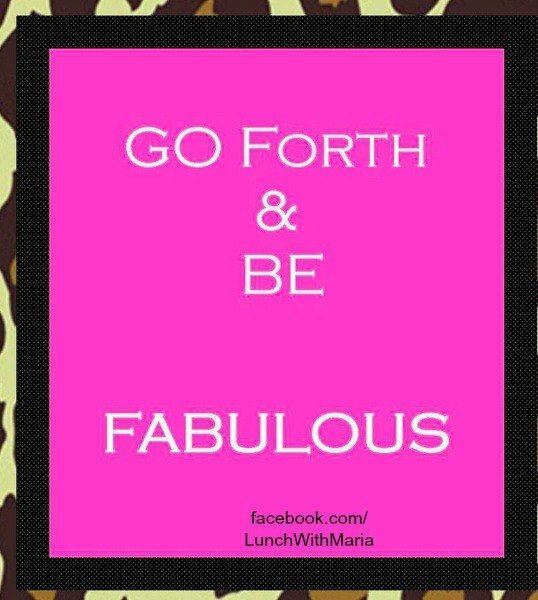 I envisioned a group where we could help and support each other to be fearless and fabulous! The group is open to all women who want to connect on a business level and on a social level. Lunch With Maria is for women who have a dream and want to take action, or women who are in the early stages of giving birth to their dream or vision. There are many entrepreneurial women who are thinking of launching their dream or who are in the early development stage. The women attending Lunch With Maria want to support each other as they achieve their dream and help others as well. There is a social awareness aspect to the group which we feel is extremely important. We want to collectively help make the world a better place as we come together and dream of what is possible. Giving back to other women who are in more challenging circumstances is an integral part of the mandate of the group. For this inaugural lunch we are donating a portion of tickets sales revenue to our charity of choice – Beauty Night. This charity was founded by the extraordinary Caroline MacGillivary – a dear friend of mine and also a member of the Ladies Who Lunch committee. * share information about your business and gain exposure. Lunch With Maria is an opportunity to help each other realize that ANYTHING is achievable. We all know – and research has shown – that women are stronger when they are connected with other women. Women collectively help make the world a better place when we come together and dream of what is possible. Women instinctively know how to nurture and add value to other people’s lives. We do it all the time as friends, mothers, daughters, girlfriends, wives and co-workers, for example. Women are used to nurturing and taking care of others and often neglect themselves. Within the Lunch With Maria group I want women to realize their power. I want them to focus on themselves and what they truly want out of life in terms of having a dream and achieving their goal. I want to bring women together to create powerful lives. I want to connect powerful and like-minded women who will inspire and support one another to reach new heights. Freedom comes from doing what you love, from not having to answer to anyone and from being independent from stress, worry and fear. Freedom and peace is realizing that you are the only one responsible for living out your dream, whatever that may look like. This freedom often takes the form of entrepreneurship where women want to take control of their life and do what it is they truly love. Oftentimes women are scared to make the transition from a 9-to-5 job in order to launch their dream. They are stuck with one foot in each place and find it difficult to move forward. Or they have been out of the work force due to a divorce, or raising children, and know they want to do something fulfilling but are not sure how to go about it. Other women would like to make social connections and gain some inspiration in a fun setting. * and performance by international musician Karla Sax. sparkly. She is the Founder & CEO of Ladies Who Lunch. Maria, I truly enjoyed reading your article. You are an inspiration and a great advocate for women. Thank You!